Today’s first was special. I got to be present for my sister Linda’s first ever 5K run. She has been in training with a group called Run for God, that then participated in Joplin’s Amazing Grace event. I passed on running a 5K until my knees are better. 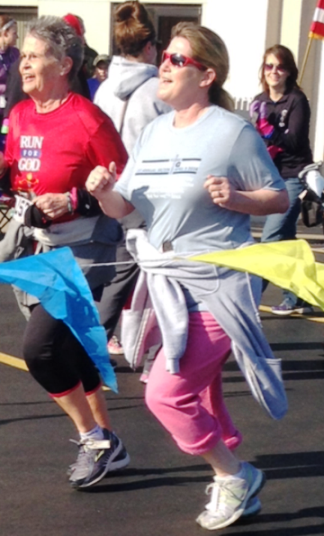 But I was glad for the opportunity to cheer Linda on and be there as she crossed the finish line. This is the first year for the Amazing Grace run, and organizer Tom Rogers hopes to hold the event yearly. 5K and 10K races were offered. Originally the race was intended as a “graduation” for the 120 people who completed the Run for God training. But ultimately 510 participants showed up from the Joplin area, Kansas City, St. Louis and Tulsa. Awards were given to the top male and female racers in each age group. Every participant received a Finisher’s Medal. Proceeds from the race went to Crossline Churches of the Joplin Area, Watered Gardens Gospel Rescue Mission, the LovinGrace Home and God’s Resort. I’m really proud of my sister. She decided to do something she’s never done before and once she committed to this race, she never wavered. 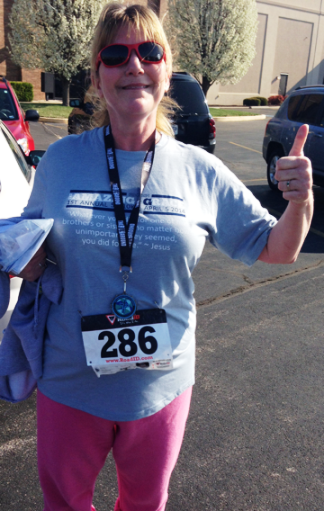 Linda completed 12 weeks of training with the Run for God group, which met every Monday night. She met new people. And being in training has made her more aware of her health and eating habits, causing her to make changes in her diet. Energy was high this morning among the group of runners gathered at Forest Park Baptist Church, in spite of the chilly weather. Linda found one of the women from her training group to run with. How wonderful to partner up to encourage each other to keep going. Linda was hoping she wouldn’t finish last. And she certainly didn’t! In an amazingly short time, she was coming down the final stretch toward the finish line. I can’t think of a better first than watching someone I love and care about experience an exciting first of her own. Way to go, Linda!